analysis to test for significant differences between mean scores and their associated standard deviations. of policies and guidelines that govern examination processes. elements of any assessment enterprise, however Fowell et al. benchmarking to review pass/fail standards for the examination. 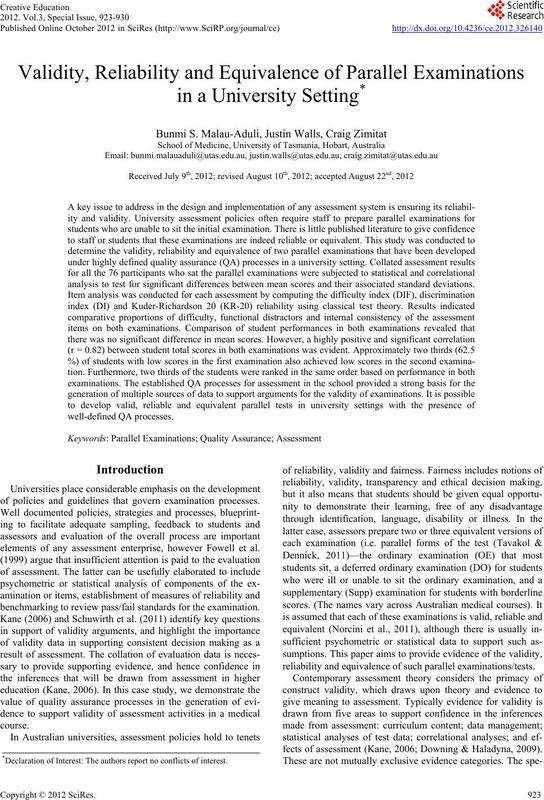 reliability and equivalence of such parallel examinations/tests. fects of assessment (Kane, 2006; Downing & Haladyna, 2009). *Declaration of Interest: The a u t h ors report no conflicts of interest. B. S. MALAU-ADULI ET AL. specification of the content to be assessed (Hamdy, 2006). and to refine test items. data handling and greater confidence in systems. vide important evidence to support or refute validity claims. routinely generated by the QA process. use of coded candidate details all contribute to this evidence. 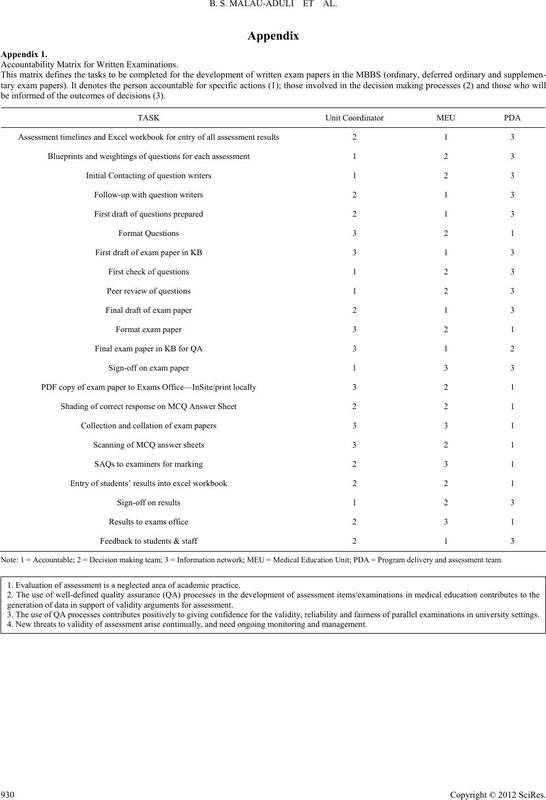 prior to being administered to students (Malau-Aduli et al. based upon the highest score achieved on either examination. the relevant ethics committee for this study. standard deviations and descriptive statistics of all the variables. Student scores were compared in the parallel examinations. distracters per item for all the MCQs were also computed. Pathology and Pharmacology (75.34% vs. 75.58%; 69.91% vs.
Descriptive statistics for both examinations. and vice versa in the Gross Anatomy questions. distractors that were not functioning effectively in their role. internal consistency of the test, was 0.71. 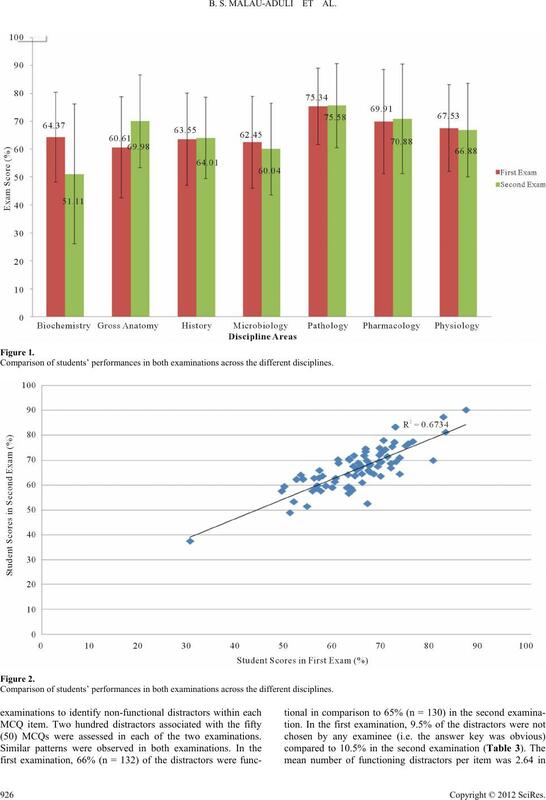 Comparison of students’ performances in both ex aminations across the different disciplines. 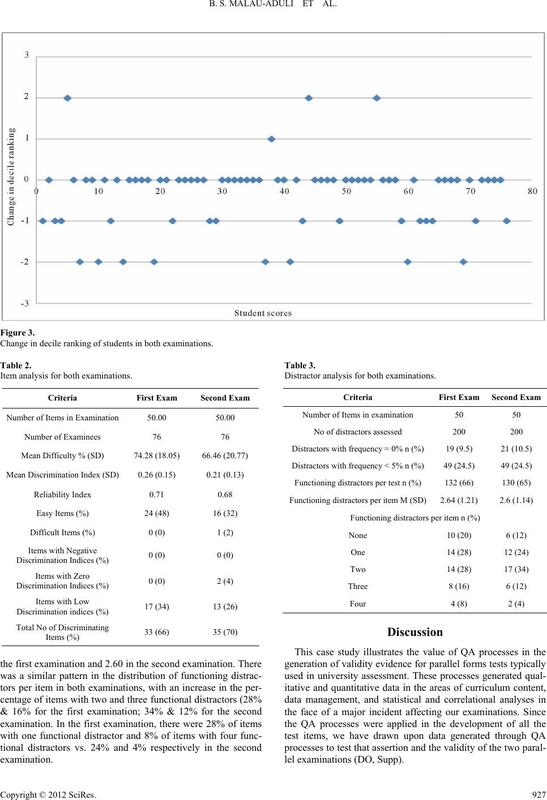 (50) MCQs were assessed in each of the two examinations. Change in decile ranking of students in both examinations. Item analysi s for both examin at io n s.
Distractor analysis for both examinations. ing outcomes underscoring the reports by Jozefowicz et al. subcategories scores obtained by students in both examinations. level of certainty (Downing & Haladyna, 2009). processes need to be reviewed regularly. as well as provide validity evidence for the observed scores. support of our conclusions about a medium stakes examination. and revision of QA processes should be an ongoing activity. assessment data. Medical Education, 37, 830-837.
ment data. Medical Education, 38, 1006-1012.
fessions education (pp. 2 1-55). London: R o ut l ed g e .
sessment: The missing link? Medical Education, 33, 276-281.
sionals. The Clinical Teacher, 3, 175-179.
medical educators. The Clinical Teacher, 5, 23-27.
examinations. Academic Medicine, 77, 156-161. Kane, M. (2006). Content-related validity evidence in test development. opment (pp. 131-153). Mahwah, NJ: Lawrence Erlbaum Associates. ity assured assessment processes: Evaluating staff response to change. Journal of Higher Education Management & Policy, 23, 1-23. R., Galbraith, R., Hays, R., Kent, A., Perrott, V., & Roberts, T.
sessments and Learning (ID E A LHK). H., Pangaro, L., Ringsted, C., Swanson, D., Van der Vleuten, C. P.
ence. Medical Teacher, 33, 224-233.
jective tests. Medical Teacher, 33, 447-458. Accountability Matrix for Written Examinations. be inform ed of the outcomes o f decisions (3). Note: 1 = Acc ountable; 2 = D e cision making team; 3 = Information network; MEU = Med ical Educati on Unit; PDA = Program delivery and asse ssment te am. 1. Evaluation of assessment is a neglected area of academic practice. generation of data in support o f v alidity arguments for assessment. 3. 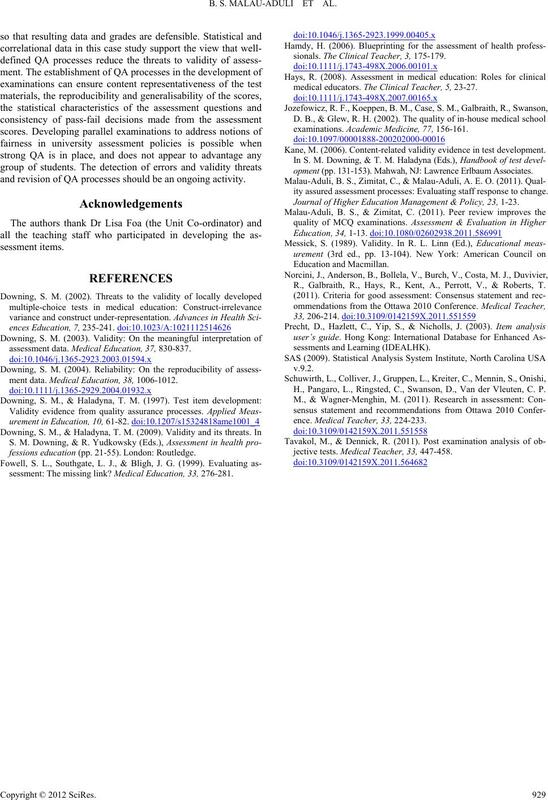 The use o f QA processes contributes positively to giving conf idence f o r t h e validity, reliability and fairness of parallel examinations in university settings. 4. 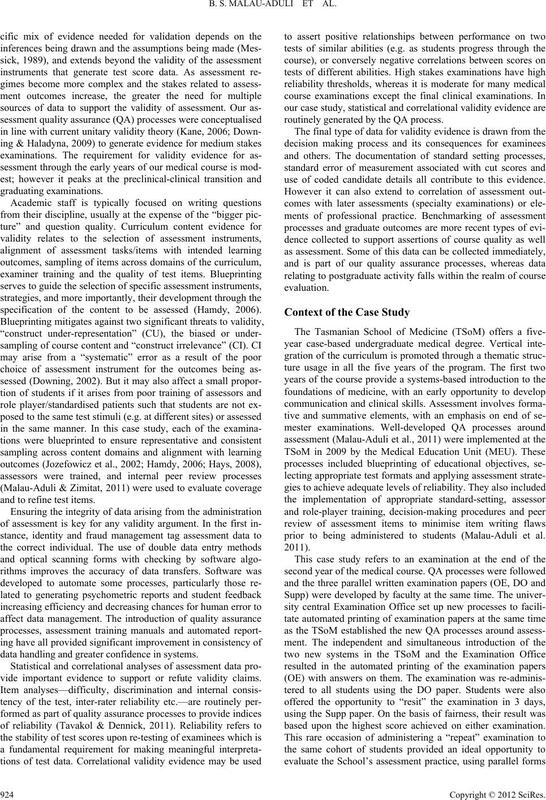 New threats to validity of assessment arise continuall y, and need ongoing monitoring and management.